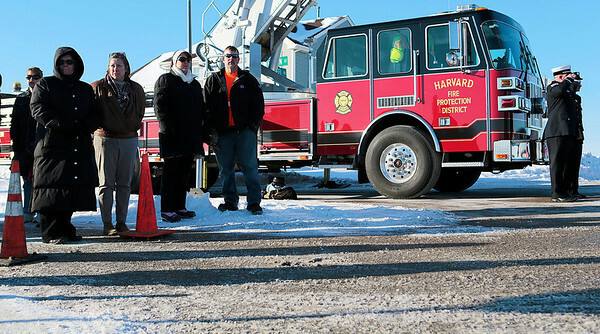 Kyle Grillot - kgrillot@shawmedia.com Spectators watch from the Woodstock square as the the funeral procession for Michael W. Wurtz, 47, a Woodstock firefighter, passes by. 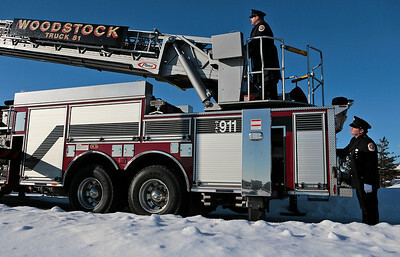 The visitation was held at the Woodstock Assembly of God Church, and the procession traveled by each of three Woodstock fire stations. Wurtz ended his battle with cancer yesterday afternoon while surrounded by family and friends. Mike is survived by his wife, three daughters and two step-children. 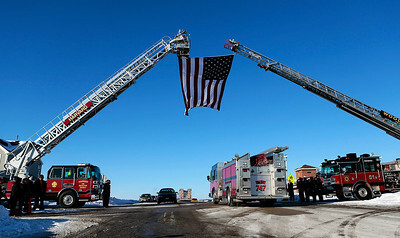 Kyle Grillot - kgrillot@shawmedia.com With a two fire trucks draping an American flag over Raffel road, Woodstock firefighters stand at attention as cars pass by during the funeral procession for Michael W. Wurtz, 47, a Woodstock firefighter. The visitation was held at the Woodstock Assembly of God Church, and the procession traveled by each of three Woodstock fire stations. Wurtz ended his battle with cancer yesterday afternoon while surrounded by family and friends. Mike is survived by his wife, three daughters and two step-children. 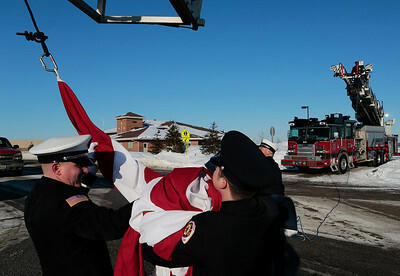 Kyle Grillot - kgrillot@shawmedia.com Firefighters lower the American flag that was draped between two fire trucks on Raffel Road. The visitation was held at the Woodstock Assembly of God Church, and the procession traveled by each of three Woodstock fire stations. Wurtz ended his battle with cancer yesterday afternoon while surrounded by family and friends. Mike is survived by his wife, three daughters and two step-children. Kyle Grillot - kgrillot@shawmedia.com Michael Wurtz' equipment on display in one of the Woodstock fire trucks after the procession. The visitation was held at the Woodstock Assembly of God Church, and the procession traveled by each of three Woodstock fire stations. Wurtz ended his battle with cancer yesterday afternoon while surrounded by family and friends. Mike is survived by his wife, three daughters and two step-children. 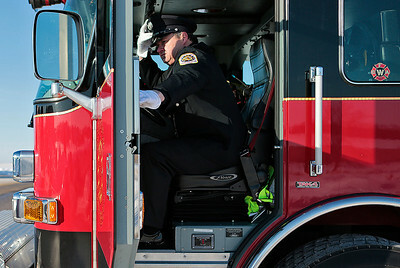 Kyle Grillot - kgrillot@shawmedia.com Woodstock firefighter Andy Harding enters a truck after the completion of the procession. 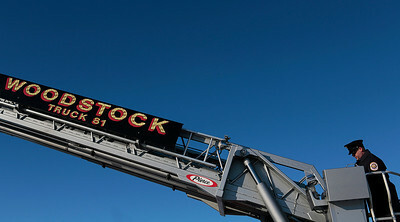 The visitation was held at the Woodstock Assembly of God Church, and the procession traveled by each of three Woodstock fire stations. Wurtz ended his battle with cancer yesterday afternoon while surrounded by family and friends. Mike is survived by his wife, three daughters and two step-children. Kyle Grillot - kgrillot@shawmedia.com Woodstock firefighter Kip Bordeau (left) and Andy Harding work to lower the American flag at the end of the procession. 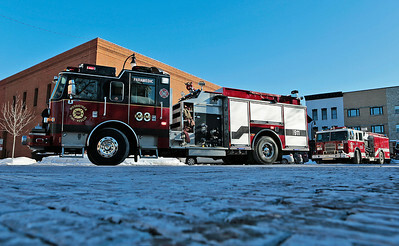 The visitation was held at the Woodstock Assembly of God Church, and the procession traveled by each of three Woodstock fire stations. Wurtz ended his battle with cancer yesterday afternoon while surrounded by family and friends. Mike is survived by his wife, three daughters and two step-children. 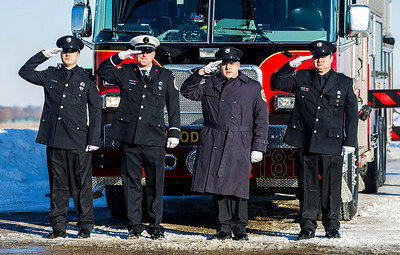 Kyle Grillot - kgrillot@shawmedia.com Woodstock firefighters gather the American flag at the end of the procession. The visitation was held at the Woodstock Assembly of God Church, and the procession traveled by each of three Woodstock fire stations. Wurtz ended his battle with cancer yesterday afternoon while surrounded by family and friends. Mike is survived by his wife, three daughters and two step-children. Kyle Grillot - kgrillot@shawmedia.com Woodstock firefighter Kip Bordeau lowers the American flag at the end of the procession. The visitation was held at the Woodstock Assembly of God Church, and the procession traveled by each of three Woodstock fire stations. Wurtz ended his battle with cancer yesterday afternoon while surrounded by family and friends. Mike is survived by his wife, three daughters and two step-children. 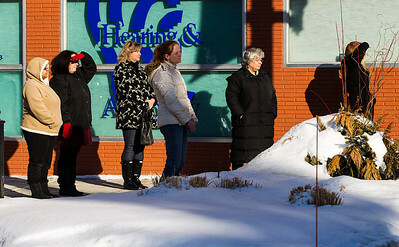 Kyle Grillot - kgrillot@shawmedia.com Spectators watch as the procession comes to an end. 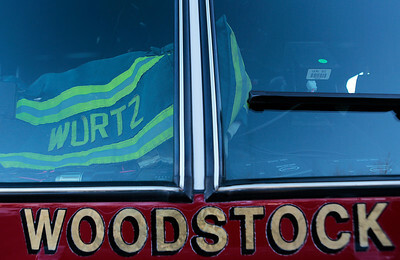 The visitation was held at the Woodstock Assembly of God Church, and the procession traveled by each of three Woodstock fire stations. Wurtz ended his battle with cancer yesterday afternoon while surrounded by family and friends. Mike is survived by his wife, three daughters and two step-children. 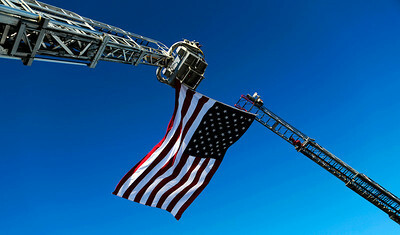 Kyle Grillot - kgrillot@shawmedia.com An American flag is draped between two fire trucks on Raffel Road. The visitation was held at the Woodstock Assembly of God Church, and the procession traveled by each of three Woodstock fire stations. Wurtz ended his battle with cancer yesterday afternoon while surrounded by family and friends. Mike is survived by his wife, three daughters and two step-children. 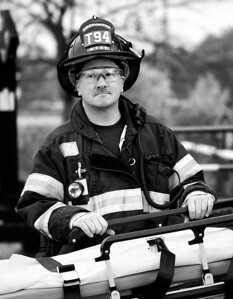 Kyle Grillot - kgrillot@shawmedia.com The procession ended at the Woodstock fire station #3, where Wurtz was married. The visitation was held at the Woodstock Assembly of God Church, and the procession traveled by each of three Woodstock fire stations. Wurtz ended his battle with cancer yesterday afternoon while surrounded by family and friends. Mike is survived by his wife, three daughters and two step-children. 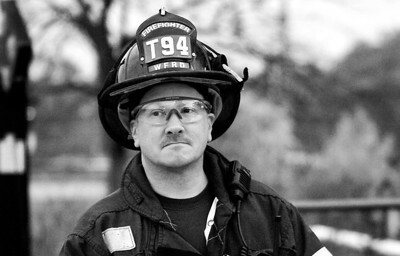 Kyle Grillot - kgrillot@shawmedia.com The procession exits Woodstock Square on it's way to fire station #3. The visitation was held at the Woodstock Assembly of God Church, and the procession traveled by each of three Woodstock fire stations. Wurtz ended his battle with cancer yesterday afternoon while surrounded by family and friends. Mike is survived by his wife, three daughters and two step-children. 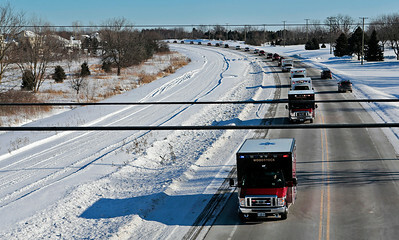 Kyle Grillot - kgrillot@shawmedia.com The procession advances north on Route 14 in Woodstock. The visitation was held at the Woodstock Assembly of God Church, and the procession traveled by each of three Woodstock fire stations. Wurtz ended his battle with cancer yesterday afternoon while surrounded by family and friends. Mike is survived by his wife, three daughters and two step-children. 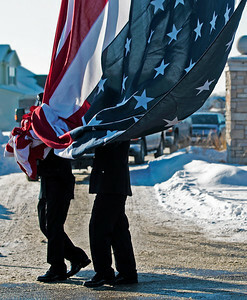 Woodstock firefighters gather the American flag at the end of the procession. The visitation was held at the Woodstock Assembly of God Church, and the procession traveled by each of three Woodstock fire stations. Wurtz ended his battle with cancer yesterday afternoon while surrounded by family and friends. Mike is survived by his wife, three daughters and two step-children.